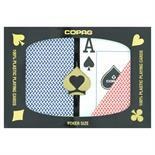 The History of COPAG is directly linked to the history of card games in Brazil. Pioneer in the manufacturing of decks COPAG has been in this market since the beginning of the 20th century. Albino Gonalvez a graphics designer founded the company in 1908 in the City of South Paulo and ever since COPAG has kept its position as the absolute leader in its market segment. Today from its modern and large industrial facilities located in Manaus in the state of Amazonas, COPAG sends part of its production to the international market exporting decks to the United States as well as to different countries in Latin America. 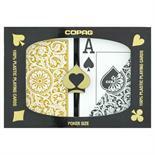 COPAG plastic playing cards are made from an exclusively engineered PVC plastic. 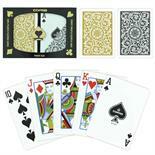 These cards can handle the wear and tear of normal games outlasting paper cards up to 500 times. Completely washable you don't need to worry about soiled cards. A quick wipe with a damp washcloth then dry and they are ready to go. Each set comes in its own hard plastic case for storage. Whether you play solitaire have a kitchen table game or manage a card room - once you try COPAG you will never use any other cards again. Try them!!! They will convince you that there are no other reasonable options for quality 100% Plastic Cards.